By buying this product you can collect up to 5 reward points as a voucher of £1.00. Your reward points. 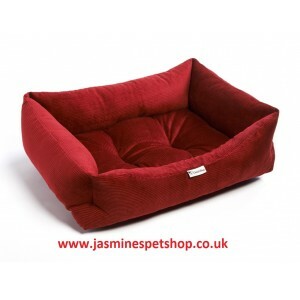 This sofa dog bed is surrounded by a thick padded cushion sides and a generously padded base cushion, making a comfortable sleeping or resting place for your pet. Generously filled with 100% virgin non allergenic fibre, to give maximum comfort and warmth retention for your pet Machine washable at 30 degrees, springing right back into shape Invertible for easy vacuuming and treatment application (please test a small non visible area before full application) The medium size is also suitable for cats.